Canadians are more likely to be satisfied with the legacy wireless carrier in their region, and poor network performance makes them more likely to switch carriers. These are among the findings of J.D. Power’s new Canadian Wireless Network Quality Study. Wireless customers expect a lot when it comes to calling, texting and web browsing on their smartphones, and connectivity issues negatively impact their view of the carrier. The study looked at the network performance of Canada’s wireless carriers in three areas – calling, messaging, and data – and in three regions – West, Ontario and East. With bring your own device (BYOD) policies, Canadians are increasingly dependent on wireless connectivity for both social and business needs, so the impact of any connectivity issues can be magnified. Overall, the study found that customers experienced the most problems with data at 14 problems per 100 (PP100) connections, followed by calls at 13PP100 and messaging at 5 PP100. Within data, slow downloads and web connection errors were the most common issues. According to the study, customers that experienced an average of 5 PP100 network quality issues said they will definitely not switch carriers, while those that averaged 17 PP100 said they definitely will be switching. Among 4G users, 13 per cent of LG device users said their data speeds were faster than expected, compared to 11 per cent of BlackBerry users, nine per cent of Samsung users and eight per cent of those with an Apple iPhone. Eastern region users had the least issues at 8 PP100, followed by the West at nine and Ontario at 10. When the carrier rankings are examined by region, the incumbent legacy carriers led the way in each market. In the West, SaskTel was on top at 8 PP100, followed by Telus Mobility at 9 PP100. In Ontario, Bell Mobility and Telus Mobility were on top at 9 PP100. 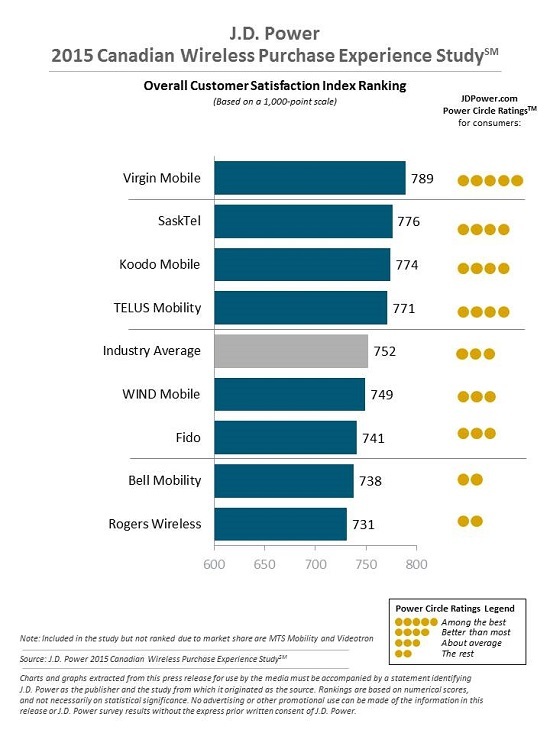 And in the East, Videotron scored the best ranking in the country at 6 PP100, followed by Bell Mobility at 7 PP100.